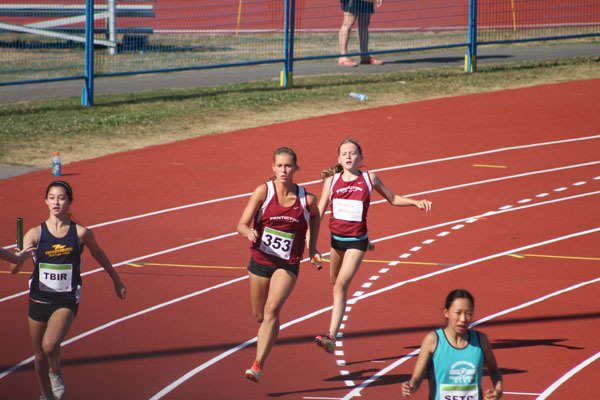 Penticton Western News – Surpassing personal bests was the focus for four members of the Penticton Athletics Club during the 37th Legion National Youth Track and Field Championships in Langley Aug. 7 to 13. Haven Dufty finished fourth in the triple jump as she leaped past her previous best of 10.81 metres to finish with 10.92. In the long jump she placed 11th overall. Her sister Hunter was 10th in the under-16 shot-put setting a new personal best at 10.89, besting her previous mark of 10.64. In the hammer throw, Hunter was ninth achieving a distance of 36.83, blowing past her previous best of 32.81. Blair Dufty, assistant coach and president of Penticton Athletics Club said their performances were amazing. The relay team consisting of the Dufty sisters along with Megan Avery and Zoe Simourd placed fifth. They broke their previous best time of 54.49 by posting 53.88 seconds. Achieving a personal best was especially important in the relay said Blair because it’s an event the athletes didn’t work on a lot. “This is only the third time they have run together as a team,” said Blair, adding that it’s a great result for a group going up against under-16 teams. Haven said she performed the best she could. Being at the Legion National Youth Track and Field Championships was a great experience for Haven, similar to last year in Prince Edward Island. Haven said being there was nerve-wracking and exciting. “I’m very happy that I was able to have a personal best at one of the biggest meets of the season,” said Haven.